Wayne Madsen, who helped Derbyshire get off to a flying start in the NatWest T20 Blast. Wayne Madsen’s role in Derbyshire’s unbeaten start to the NatWest T20 Blast has been rewarded with a place in the top ten of the Professional Cricketers Association’s Most Valuable Player (PCA MVP) rankings for the competition. 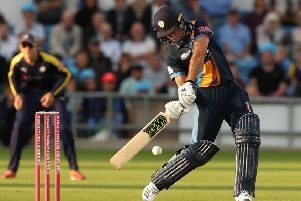 Madsen made 37 from 22 balls to help set up victory over defending champions Northamptonshire in Derbyshire’s opener and followed up with 42 from 28 balls in the win over Yorkshire at Chesterfield. His efforts in those two matches earned Madsen 31 PCA MVP points and took him to tenth place in the rankings table, 19 behind Sussex all-rounder Luke Wright, the early pacesetter. The PCA MVP Rankings system identifies the matchwinners and key influencers of fixtures throughout the domestic season. The formula takes into account conditions, quality of opposition, captaincy and strike rates, as well as runs scored and wickets taken. Madsen is 50th in this season’s overall PCA MVP, which covers all competitions. In the T20 Blast rankings, Hardus Viljoen is Derbyshire’s second highest-placed player in 20th spot with 23 points from two matches.